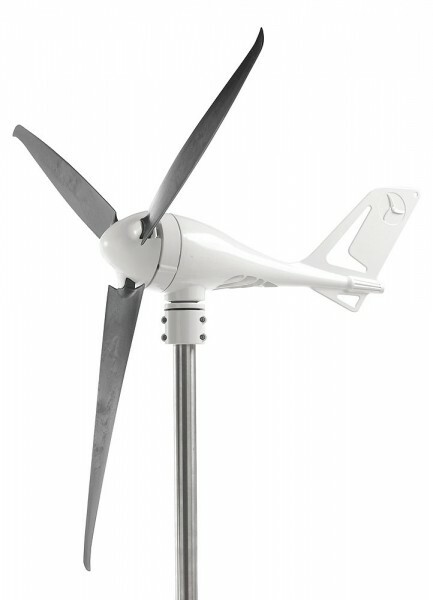 Produktinformationen "S700-E 12V Wind Turbine"
Produce 10 W power with a wind of just 3 m/s and relieve your battery when you are not connected to a shore power connection. The complete set - a 400 WP wind generator and a 12V DC voltage converter - is extremely efficient, thanks to its high-performance blades. The extremely small dimensions, very low noise level and almost non-existent vibration are unique. The wind turbine operation is very quiet. Protection mechanism are very important for a wind generator. A voltage-controlled brake reduces the speed in strong winds and storms. At 18 m/s the blades are stopped entirely and charging is interrupted in order to limit damage to the mechanism. The voltage converter displays the battery level using LEDs. The set can deliver a charge current of up to 25 A. Specifications: Rotor diameter: 112 cm, Generator length: 68.6 cm, Min. mast height: 55 cm, Weight: 6.5 kg. Weiterführende Links zu "S700-E 12V Wind Turbine"